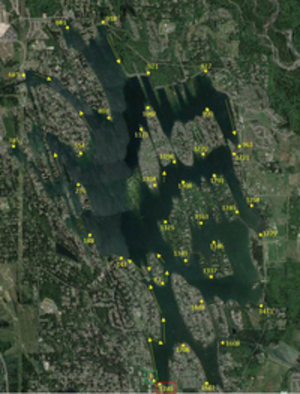 THE INCIDENT LOCATOR program is designed to get emergency resources to the scene of water related and land based incidents on Lake Tapps as quickly and efficiently as possible. When time matters most! Three separate dispatch agencies receive 911 calls for emergencies on Lake Tapps? Four separate agencies regularly respond to emergencies on Lake Tapps? The caller to quickly identify their specific location by providing the 911 dispatcher the number from the nearest brown and white sign on the dock or shore. Waterfront properties have been numbered sequentially and continuously around the lake. Signs with the property's assigned number will be mounted to each dock allowing boaters/swimmers to easily see a number from any point along the shoreline. 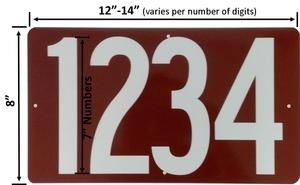 Where no dock is available, the number signs will be placed on a posts or other appropriate location. There are three sign mounting location options. Cost: $28 per sign FREE due to funding from Cascade Water Alliance (while supplies last). Or in person at our Headquarters Station (18421 Veterans Memorial Dr E, Bonney Lake). The signs are made to order, so please allow 3-4 weeks for processing and manufacturing. You will be contacted by telephone when your sign and hardware are ready for pick up at our Headquarters Station (18421 Veterans Memorial Dr E, Bonney Lake). Your privacy is important to us. The personal information you enter online such as credit card, name, phone number, email and mailing address, are protected by InternetSecure. This site may request personally identifiable data from you (“personal information”), which may include your email address, and other personal information such as your address, telephone number, credit card number and expiration date, etc. East Pierce Fire & Rescue endeavors to do its best to protect the privacy of your personal information and will not use this information except in connection with your use of this web site so that we can provide you with the highest quality of services. We may use your email address to send you information concerning the organization and this website, unless you advise us that you do not wish to receive this information.